We are New Zealands leading supplier for the abrasive blasting and industrial coating industry! Blastquip is a family owned and operated business. We specialise in and have been supplying New Zealand's abrasive blasting, coating and corrosion control industry for the past thirty years. Our management team have been in the industry all their working lives and have a vast experience in the Abrasive Blasting Industry. All our friendly and helpful sales staff are all fully trained in our product range and have many years of experience to help you with every aspect of your purchase. 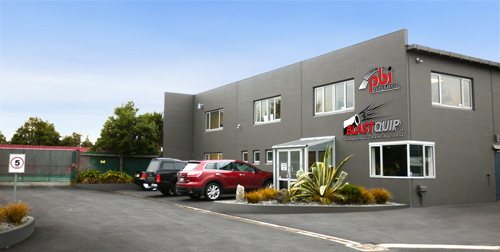 Our head office is based in Christchurch with fourteen full time employees. We also have sales representatives based in Auckland and New Plymouth and have nine abrasive stores throughout New Zealand to service your needs. Blastquip formally Blastmaster and Rayphil rebranded as Blastquip in 2000 extending our product range and staff to become the One-Stop-Shop for the Industrial Blasting and Painting industry. We can supply the Industry with every requirement including Blasting Equipment, Airless Painting Equipment, Containment Material, Blast Helmets, Breathing Air Equipment, Graffiti Removers, Paint Strippers, Abrasives, Purpose Built Blast Rooms and Spray Rooms, Abrasive Recovery and Recycling, Testing Equipment, Coating thickness and Ultra Sonic Gauges and much more. Our policy is to supply the right product to you our valued customer every time. We only stock the best quality and latest products available from reliable manufacturers such as GMA for garnet, Schmidt blast units, RPB operator protection, Graco and Tritech painting equipment and TQC testing and quality control equipment. This means you can rely on our products and be reassured you have the back up of Blastquip's outstanding service, extensive knowledge and decades of experience as well as being supported by our well known and reliable suppliers giving us a vast network of industry experts throughout the world to draw on for expertise.